Sadly we have to announce that more cases of Alabama Rot have been confirmed by veterinary specialist referral centre, Anderson Moores. The cases confirmed so far this year are from Dublin, Penkhull in Staffordshire, Bearwood, West Chelborough and Ensbury Park in Dorset, Cullompton in Devon, Stalybridge in Greater Manchester, Crewe in Cheshire, Caldicot in Monmouthshire, Claverdon in Warwickshire and Malvern in Worcestershire. Here we look at a subject close to our hearts. Please see the link to Caroline Ingraham of the Ingraham Academy of Zoopharmacognosy. The word comes from the Ancient Greek, Zoo (animal) Pharma (remedy) Cognosy (knowing), and is the process by which animals self medicate in their natural environment by seeking out plants, herbs and essential oils to maintain their health. Early humans once shared their innate ability but sadly, modern civilisation has done much to diminish our natural instincts. A simple example can be the way dogs seek and eat grass to purge their stomachs when they are feeling queasy or off colour. Years ago I watched one of my horses going around the perimeter of his field picking and eating blackberries which I discovered were helpful in treating diarrhoea. 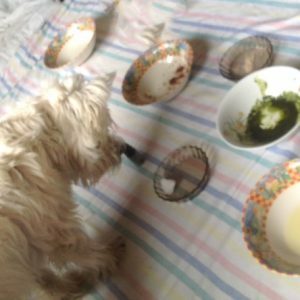 We also had a westie that asked to go into the garden to eat a Lungwort plant. 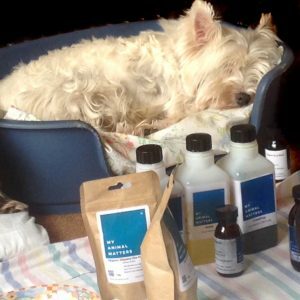 At first we found this behaviour bizarre until we realised that herbalists use the plant to treat chronic chest infections and coughs – Daisy suffered from breathing problems! 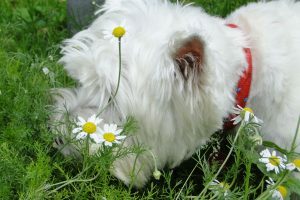 This westie is seeking out Chamomile, known to be comforting in sensitive nervous dogs, including of course rescue dogs. Many dogs seek garlic, either the bulb or the leaves of the wild garlic plant. Garlic is an anthelmintic (dispels worms) as well as discouraging fleas and other parasites. A fascinating subject, why not investigate Zoopharmacognosy for yourselves? Something appears to be taking effect!